Sunlight and birdsong are streaming through my wide-open window. The occasional bee buzzes in, looks around and buzzes back out. From the park I can hear the chatter and excited squeals of families and the quintessentially English sounds of cricket. 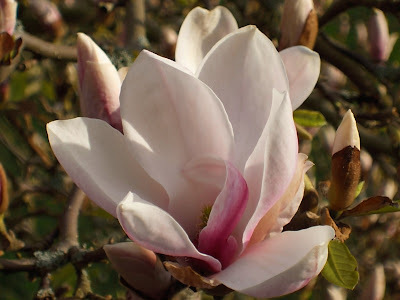 The magnolia is blossoming, as are other trees and flowers, and I'm wearing lighter clothes and no socks. It's Saturday 20th April and yes, spring has finally sprung!! For many of us there is also a new spring within the Church: a refreshing breeze from Rome, and here in England and Wales, encouraging news about entrants to seminaries and religious life. In 2011 we got excited when 17 women entered religious life (and my congregation got VERY excited because three of them joined us! ), but now it seems that in 2012 twenty-three women took their first steps in apostolic religious life. Once the figures from monasteries are added I'm sure they will exceed thirty, which they haven't done since the mid-1990s, when I entered. Yes, indeed, spring has well and truly sprung!! Tomorrow, Good Shepherd Sunday is also Vocations Sunday, when we pray very specially for more people to experience the joy of finding the treasure for which they were created. I know from my personal experience that many people approach this apprehensively: viewed from the outside, religious life can appear uncongenial, a series of very obvious noes, with little hard evidence of the corresponding recompense. I well remember thinking, twenty years ago, how the hundredfold promised by Jesus was all very well, but it seemed vague and spiritual compared with the lovely flat, lifestyle, career etc I would be giving up! In fact, as I have come to discover, the hundredfold is anything but vague. It is so very real; something joyous, glorious and wonderful, all the better for so often being unexpected. It is a process of growth and transformation, with challenge and risk alongside deep inner peace and joy, an unfolding, a becoming, a true adventure. For me this adventure is lived within the Heart of Jesus, journeying into its depths and into the heart of the world; seeking to live united to that Heart in order to make known the love of that Heart - a tall order, but also a privilege I share with several thousand women around the world, women who are an essential part of that hundredfold. A privilege, an adventure, a becoming who I am created to be... religious life, with its demands and its hundredfold, is all this and more. And when I pray for more vocations, as I will very specially do tomorrow, I pray that more women and men will have the joy of experiencing and discovering all that and more for themselves.